Conservatives have taken to social media to remember the night that Margaret Thatcher came “within minutes” of being killed at 1984 Party conference. 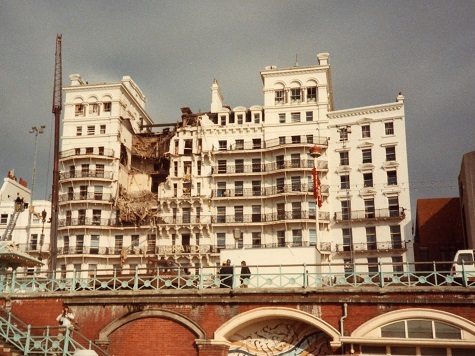 She was staying at the Grand Hotel in Brighton when an IRA bomb several floors above her suite brought the hotel roof crashing down onto her bed. Five people were killed and a total of 51 people injured when the bomb went off at around 3am on 12th October 1984. 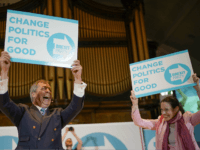 A number of senior Conservatives were trapped in the wreckage they included Parliamentary Treasury Secretary John Wakeham and the President of the Board of Trade Norman Tebbit. Roberta Wakeham was killed and Margaret Tebbit remains virtually completely paralysed. IRA operative Patrick Mcgee had planted the bomb around a month earlier, by hiding it behind a bath panel. His plan was simply to bring the chimney stack above the room down, he hoped it would crash from floor to floor eventually hitting the Prime Minister as she slept. The plan would have worked except Thatcher was famously hardworking, and only slept three to four hours a night during party conference. So instead of being in bed, she was working on her final paper of the night. Had she not taken the time to finish the paper and instead gone to bed she would almost certainly have been killed. Her husband Denis was in bed but the stack missed him completely. This solicited a standing ovation from delegates and unusually from the political journalists present as well. Many of those in the hall were forced to flee the hotel in their sleep wear and so the Conservative Party treasurer Lord McAlpine asked Marks and Spencers to open early so they could buy new clothes. David Cameron posted on Facebook: “Thirty years ago today, Britain woke up to the news of the Brighton bombing. On a night of unspeakable horror, IRA terrorists tried to wipe out our country’s democratically-elected government. “Five people were murdered that night – Anthony Berry, Roberta Wakeham, Eric Taylor, Muriel Maclean and Jeanne Shattock – and many more suffered appalling injuries, including Lord Tebbit and his wife Margaret. “I will never forget those shocking images as members of the emergency services scrambled over the rubble to rescue those wounded in the blast. But I also remember Margaret Thatcher’s defiant response later that day. “She declared Britain will never be cowed by terrorists and said their sickening attempts to destroy our democracy would fail. “It is a message we repeat today as we face down the threat from violent extremism, whether in the skies over Iraq or on the streets of our towns and cities. Patrick Mcgee was caught within weeks of the attack, and sentenced to 35 years in prison. He was released in 1999 as part of the Good Friday Agreement in which terrorists were allowed home in exchange for a permanent cease fire in Northern Ireland. Norman, now Lord Tebbit said: “I am often asked if I can find it in my heart to forgive the creature, Patrick Magee, who planted the bomb. That is not possible, for Magee has never repented.” His injuries are said to have left him in constant pain ever since the attack, he remains principal carer to his wife.